Little Dixie Community Action Agency, Inc. partnered with AmeriState Bank (Antlers, OK) and International Paper-Valliant to provide twenty seven families with Thanksgiving Food Baskets complete with turkey, pumpkin pie, vegetables and all the ingredients for a wonderful Thanksgiving meal. Little Dixie would like to say “Thank You” to our Sponsors! 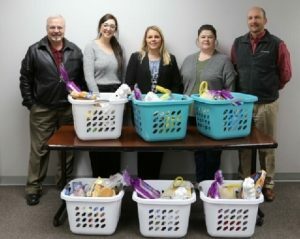 Pictured left to right are Johnny Moffitt-LDCAA Associate Director; Macy Self-LDCAA Program Planner; Becky Reynolds, LDCAA Executive Director; Dawn McDaniel, LDCAA Human Resource Director and Myrl Redman, LDCAA Associate Director.